My card for today is made using the If Bunnies Could Talk stamp and die set from Taylored Expressions, I just love how quick and easy this came together, you can totally change up his little face with the different expressions that are available and there are some sentiments as well that are so fun! The tiny sun and clouds are also from Taylored Expressions. 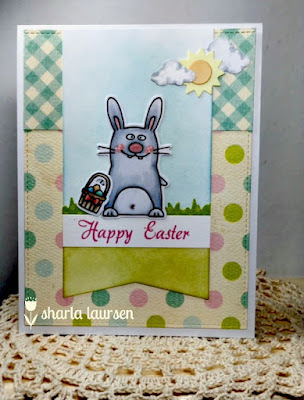 I made this card for the+ Share Joy challenge at Taylored Expressions and used the sketch for inspiration. This is just so cute Sharla! Thanks so much for joining us at The Sisterhood’s ‘THINK SPRING’ challenge and please come back again soon! So cute! Love the scene that you created, Sharla! I adore the pattern paper that you chose! Thanks so much for playing Simon Says Stamp Wednesday “Anything Goes” Challenge! What a fun bunny! Fab card too! Thanks for joining us at Little Red Wagon. Oh gosh...I just laughed out loud when I saw this adorable bunny. The colors are colored so nice and rich!! You did a fabulous job! Thanks for "THINKING OF SPRING" with us over at the Sisterhood of Crafters.